Shining lasers at tiny pink diamonds is being used to measure how living cells die. We hope this will help us understand how and when chemotherapy is effective to kill cancer cells, and therefore improve cancer treatment. Diamonds are widely desired for as gemstones due to their transparency and lustre, but our research focusses on diamonds that lack this prized perfection. Specifically, if two carbon atoms in the diamond are replaced by a nitrogen atom, then the resulting defect produces a pink colour in the diamond. The protection of the strong diamond structure allows the defect to exhibit quantum physics that is normally reserved for objects near absolute zero. Using this behaviour, pink diamonds have recently been demonstrated as precise nanoscale sensors for temperature, magnetic field, electric field, pressure, and nanoscale chemical sensing. Excitingly, these tiny diamonds are also non-toxic and so provide a powerful potential sensor for living biological cells, including cancer. In this paper we looked at the difference between diamonds that are covered in graphite (‘dirty’ diamonds) and diamonds without this surface covering (‘clean’ diamonds). We found that ‘dirty’ diamonds caused the cancer cells to become stressed, whereas ‘clean’ diamonds did not. Since we would like to use diamonds as a measurement tool, we now know it is best to use ‘clean’ diamonds in our measurements, as these do not affect the cells we are measuring. Most cancer chemotherapy treatment fails because cancer cells develop mechanisms to resist death over time. Based on this research we are aiming to apply the sensing abilities of pink diamond to develop a transformative new measurement tool of this in cells. By overcoming challenges in physics, chemistry and biology, we aim to predict the cell’s fate very early after treatment, or watch how resistance develops over time, equipping scientists with a new weapon in the fight against cancer. 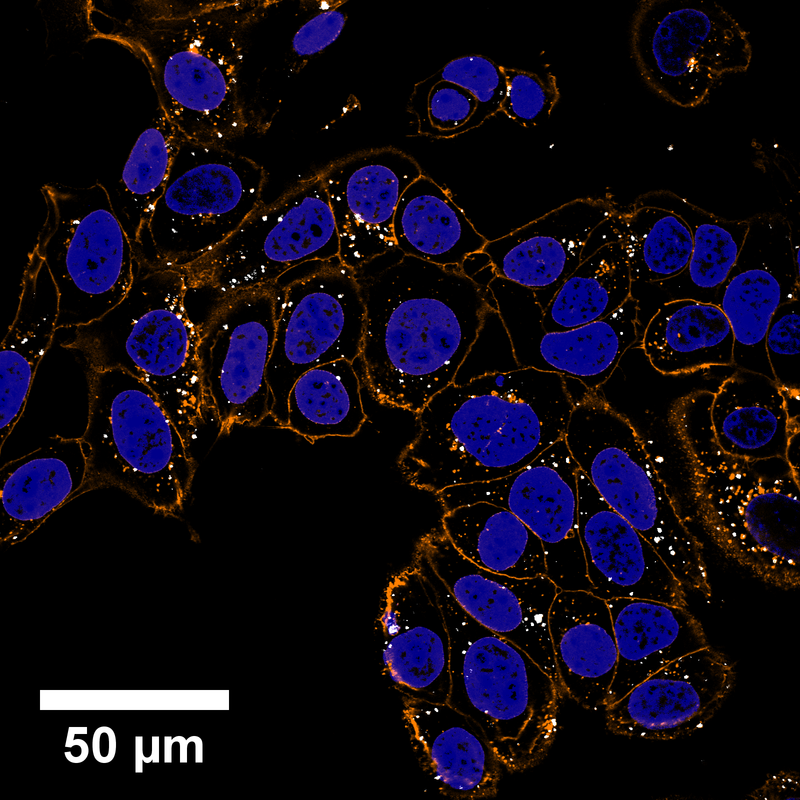 Oxidised nanodiamond uptake observed in cancer cells. Cells were incubated with the oxidised nanodiamonds for 48 hours. Blue shows the cell nuclei. Orange shows the cell membrane. Nanodiamonds (white spots) can be seen inside the cells. Read more in the original journal article.